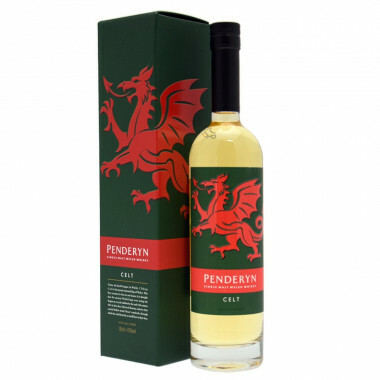 The Penderyn Celt is the new Single Malt of the distillery from Wales, matured in former peated quarter casks. The Penderyn Celt is the new Single Malt of the distillery Penderyn, located in Wales, matured in former peated quarter casks (1/4 of the usual volume), it has marked smoky and peated aromas as well as a lot of complexity in the mouth, with notes of spices and fresh fruits. Nose: sweet aromas of peat and smoke, chocolate-flavoured and fruity notes (anana, golden apple). Palate: a lot of sweeteness at the beginning, then smoky flavours and even medicinal notes. A marked taste of peat as well as flavours of tobacco, spices (cinnamon, ginger) and fresh fruits (raspberry, strawberry). Finish: long, smooth and fresh, with some bitterness (melon and watermelon). Gold Medal World Whisky Masters 2016 in the category " Europe Single Malt Premium Whiskies ".